Written by an outstanding team of internationally recognised experts, this practical textbook is based on the European Certificate in Anxiety and Mood Disorders. 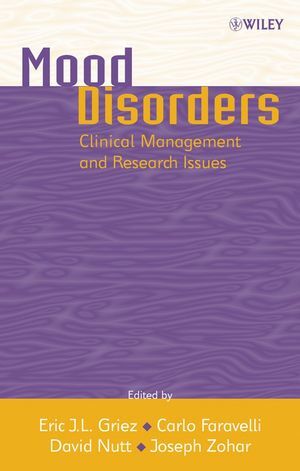 It provides a thorough overview of diagnosis and treatment of mood disorders and analyses the most recent developments and scientific evidence. Professor Eric J. L. Griez, Maastricht University, Department of Psychiatry & Neuropsychology, Maastrich, The Netherlands. 1 The Epidemiology of Mood Disorders (Jacobi et al). 2 Genetics of Mood Disorders (Serretti). Part II: Syndromes and Nosology of Mood Disorders. 3 Unipolar Depression (Faravelli et al). 5 Subthreshold Mood Disorders (Pini et al). 6 Suicidal Behaviour (de Leo and Spathonis). 7 Neurobiology of Depression (Cowen). 8 Stress and Depression: The Inflammatory Hypothesis (van West el al). 9 Brain Imaging in Affective Disorders (Malizia). 10 The Treatment of Depression (Hale). 11 Psychological Treamtent of Depression (Roelofs and Muris). 12 Treatment-Resistant Mood Disorders: From Diagnosis to Treatment (Souery et al). 13 Brain Stimulation in Depression (Schlaepfer and Kosel). Part V: Research Issues and Debates. 14 Potential Targets for the Treatment of Depressive Disorders (Rollema and Sprouse). 15 Sleep Research and Affective Disorders (Wilson and Nutt). 16 Implementing Clinical Trials (Cosci and Faravelli). 17 Mood and Anxiety Disorders - A Diagnostic Pleonasm? (van Praag). 18 At the Interface of Depression and Anxiety: Comorbidity and Concepts (Overbeek and Griez).